Marvel’s STAR WARS comics have pulled back the curtain on fan favorite Captain Phasma, introduced the world to rogue archeologist Doctor Aphra, and crafted stories that have enthralled fans across the galaxy. This December, even more secrets will be revealed when Marvel releases STAR WARS: THE LAST JEDI – STORMS OF CRAIT #1. 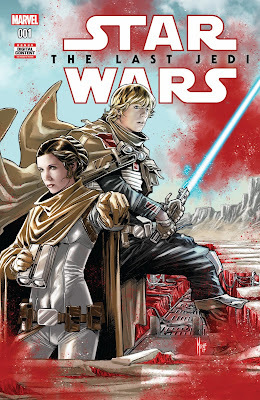 Written by Ben Acker and Ben Blacker (Star Wars: Join The Resistance) with art by Mike Mayhew (Star Wars, The Star Wars), the new mini-series gives fans a look behind the curtain at one very special planet in the galaxy: the mineral planet Crait. In Star Wars: The Last Jedi, it becomes a battleground between the Resistance and the First Order, but that wasn’t the first time Crait became a place where heroes and villains clashed in their fight for the galaxy. Luke Skywalker and Leia Organa once took up arms on Crait and led the rebellion as they as they searched for a new home – and a new base for the Rebel Alliance. Tying in to the eagerly anticipated December film, STAR WARS: THE LAST JEDI – STORMS OF CRAIT promises to be a new and exciting adventure for all Star Wars fans – and a story that will change the galaxy as we know it. Find out what mysteries Crait holds for yourself when STAR WARS: THE LAST JEDI – STORMS OF CRAIT hits comic shops on December 27th!